Ship of Life: SAM Manekshaw- The Parsi Brave man of India. 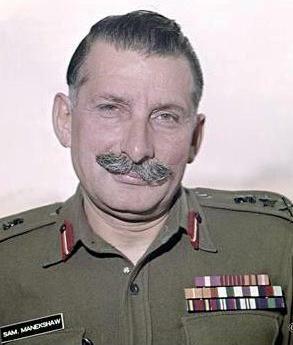 SAM Manekshaw- The Parsi Brave man of India. Hey guys, here I am again. Yesterday, I was thinking of how and why the two countries -U.S.A and Korea are headstrong on each other and are on the verge of War. It bought my attention on our immediate neighbors who are ever plotting to stab us on our back-The India. And guess what! The same day, I got a forwarded email from my boss at LetsNurture about an Indian hero who was a Parsi-the peace loving community man, yet a brave soldier in Indian Army. The person who was the first field marshal in the Indian army and the person who was instrumental in bringing us victory in the war against Bangladesh. Here, I am presenting some of the great man- Sam Manekshaw's own words experience on his mission to Kashmir. It is a bit long but worth reading friends. The story he tells here is from the time when he was a colonel in the Army during early Indian independence time. Then a colonel, he was chosen to accompany V P Menon on his historic mission to Kashmir. This is his version of that journey and its aftermath, as recorded in an interview with Prem Shankar Jha. Since I was in the Directorate of Military Operations, and was responsible for current operations all over India, West Frontier, the Punjab, and elsewhere, I knew what the situation in Kashmir was. I knew that the tribesmen had come in - initially only the tribesmen - supported by the Pakistanis. Tom and his wife were holidaying in Baramulla when the tribesmen killed them.The Maharaja's forces were 50 per cent Muslim and 50 per cent Dogra. The Muslim elements had revolted and joined the Pakistani forces. This was the broad military situation. The tribesmen were believed to be about 7 to 9 kilometers from Srinagar. I was sent into get the precise military situation. The army knew that if we had to send soldiers, we would have to fly them in. Therefore, a few days before, we had made arrangements for aircraft and for soldiers to be ready. and he had made arrangements for the aircraft from civil and military sources. Anyway, we were flown in. We went to Srinagar. We went to the palace. I have never seen such disorganization in my life. The Maharaja was running about from one room to the other. I have never seen so much jewellery in my life pearl necklaces, ruby things, lying in one room; packing here, there, everywhere. There was a convoy of vehicles. Jawaharlal Nehru and The Maharaja were coming out of one room, and going into another saying, 'Alright, if India doesn't help, I will go and join my troops and fight (it) out'. I couldn't restrain myself, and said, 'That will raise their morale sir'. Eventually, I also got the military situation from everybody around us, asking what the hell was happening, and discovered that the tribesmen were about seven or nine kilometers from what was then that horrible little airfield. V P Menon was in the meantime discussing with Mahajan and theMaharaja. Eventually the Maharaja signed the accession papers and we flew back in the Dakota late at night. There were no night facilities, and the people who were helping us to fly back, to light the airfield, were Sheikh Abdullah, Kasimsahib, Sadiqsahib, Bakshi Ghulam Mohammed,D P Dhar with pine torches, and we flew back to Delhi. I can't remember the exact time. It must have been 3 o'clock or 4 o'clock in the morning. (On arriving at Delhi) the first thing I did was to go and report to Sir Roy Bucher. He said, 'Eh, you, go and shave and clean up. There is a cabinet meeting at 9 o'clock. I will pick you up and take you there.' So I went home, shaved, dressed, etc. and Roy Bucher picked me up, and we went to the cabinet meeting. Almost every morning the Sardar would sent for V P, H M Patel and myself. While Maniben (Patel's daughter and de facto secretary) would sit cross-legged with a Parker fountain pen taking notes, Patel would say, 'V P, I want Baroda. Take him with you.' I was the bogeyman. So I got to know the Sardar very well. couldn't fly troops in. Everything was ready at the airport. As usual Nehru talked about the United Nations, Russia, Africa, God almighty, everybody, until Sardar Patel lost his temper. He said, 'Jawaharlal, do you want Kashmir, or do you want to give it away'. He (Nehru) said,' Of course, I want Kashmir (emphasis in original). Then he (Patel) said 'Please give your orders'. And before he could say anything Sardar Patel turned to me and said, 'You have got your orders'. I walked out, and we started flying in troops at about 11 o'clock or 12 o'clock. I think it was the Sikh regiment under Ranjit Rai that was the first lot to be flown in. And then we continued flying troops in. That is all I know about what happened. Then all the fighting took place. I became a brigadier, and became director of military operations and also if you will see the first signal to be signed ordering the cease-fire on 1 January (1949) had been signed by Colonel Manekshaw on behalf of C-in-C India, General Sir Roy Bucher. That must be lying in the Military Operations Directorate. That was Sam Manekshaw for you.. Some more will come up on him pretty soon. I think the only person who should have been born twice in India today is this guy. I thank my Boss Mr. Ketan Raval for forwarding me this email.